The ATA Annual Conference is, I believe, the biggest translation conference aimed at translators in the world. This year, over 1,600 translators converged on San Diego in the USA to learn, share, and catch up with friends and colleagues. I’d been threatening to attend since about 2009 when I first noticed the conference making a splash on Twitter. This was the year it happened for me. The trip took 25 hours door to door, from my home in Brisbane to the Hilton San Diego Bayfront. I travelled relatively light, with essentials including a stash of business cards, blister plasters, laptop and spare phone battery. If the conference were on a desert island and I could only bring one of these items, I’d go for the blister plasters – no question. It’s impossible to do everything at a conference this size. And I was going to be travelling a long way for only five days, with a 17 hour time difference to adjust to. So I was careful to set some realistic goals before leaving. My main aim was to put faces to the names I’d been following online for so many years. I wanted to focus on things I wouldn’t normally have a chance to experience here in Brisbane. I don’t know if there’s such a thing as a typical first timer at an ATA Annual Conference, but if there is, I’m pretty sure I don’t fit the bill. I’m well established in my career, I was travelling quite a bit further than the average attendee, and although I hadn’t “met” any of the other attendees face to face before, I had been communicating with many of them online – some for several years. So I was fortunate in feeling that I would be among friends. I also wanted to fully enjoy the bits “in between” the conference sessions, to soak up the character of the conference itself. I’m glad I did – I had some of the most memorable parts of the trip that way. The programme included over 200 sessions. Many catered to more experienced translators, with some very specialised practitioners speaking on their areas of expertise. These sessions were of particular interest to me. But as over 150 of them would be available afterwards on the conference DVD, I decided to view attending sessions as a bonus. I particularly enjoyed the inclusion of leadership training on the programme. It’s a topic that has been sorely lacking from other industry events I’ve attended over the years. Our professional associations are run by teams of volunteers largely, yet few of us have formal training or indeed significant practical experience in this area. Quality leadership training is a way to attract, retain and motivate volunteers. It helps us do a better job, it makes our associations stronger and by extension, benefits our entire profession – a win-win situation all around. Given my main goals, as outlined above, I thought I did well to attend five sessions, although I often found myself sneaking in late or creeping out early on my way to another meeting. I plan to write up my notes on these sessions in separate posts. Breakfast was provided daily over a leisurely hour on a sunny patio with a stunning view. There were a couple of large round tables set up and people arrived and left at different times, mingling freely. This proved an excellent opportunity to network in a non-threatening and friendly environment, and set the day up nicely. The conference app added an interesting dimension to the event. Available to registered attendees only, it made it easier to get the most out of the conference, before during and after the event itself. For example, I used it to look up and connect with fellow attendees, speakers and exhibitors, plan which sessions I’d like to attend well in advance, and complete session surveys. On the low-tech side of things, the conference name tag proved surprisingly useful on many counts. The coloured dots representing our language combinations and the use of ribbons to denote special categories (e.g. first time attendee, speaker, grader, certified status, etc.) were not only great conversation starters, they also made it easy to see who might be useful to talk to about specific aspects of the profession. It had a couple of handy pouches too which were perfect for storing business cards. There was a definite move towards reducing paper during the conference, with all handouts available via the conference app. I also found I exchanged fewer business cards than I expected, as I could use the app to more usefully connect with people directly via email, Twitter or LinkedIn – which has also cut down on my post-conference work. I still made frequent use of the streamlined paper-based conference programme though, so I’m not suggesting a completely paperless conference would be preferable. I think these initiatives reflect changes in the way we consume information generally, and ATA is to be commended for keeping up with that. This conference felt more like a holiday than work for me, for many reasons. I’m sure this came across in my interactions with people, some of whom may have been focussed on more work-oriented goals. This was probably not the most business savvy of approaches on my behalf. But I felt relaxed and comfortable with the people and the surroundings, and thoroughly enjoyed the whole experience. After waiting so many years and travelling so far to attend, I don’t think I would have had it any other way. Maybe it was the result of my own slightly-less-reserved-than-usual attitude (see point above), or maybe it was the laid-back California location – either way, I found my fellow attendees to be especially open, friendly and welcoming. I’m as guilty as the next translator of being a little rusty in the social skills department at times, but I didn’t get a sense of this here at all. Interactions just seemed… to work. Finally, if you are even remotely considering attending an ATA Annual Conference in the future, I can’t recommend Jill Sommer’s webinar for first timers highly enough (free from the link on this page). It was an essential part of my pre-conference preparations, and the earlier you listen to it, the more you’ll get out of it. Jill covered everything from business card and resume conventions to networking and programme tips, and even answered some FAQ on her blog. I’ve tuned in for two years in a row now, and it’s what made the conference seem accessible to me in the first place. Without it, I’m sure it would have been at least another five years before I’d felt up to the trip, and I certainly wouldn’t have gained as much from the event. Any other first-time attendees out there? What did you think? 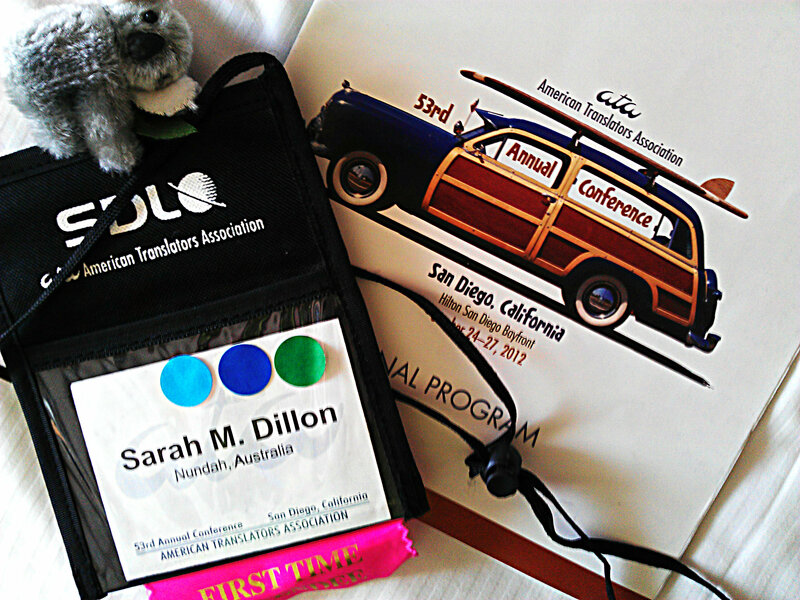 I wanted to briefly share with you my experience at the ATA Conference in San Diego as a first time attendee and a newbie in the world of translation. Like you, I also watched the ATA webinar for first time attendees. Jill provides invaluable advice about business cards, resumes, sessions, networking and relaxation that is so important to those attending for the first time and for those, like myself, new to the industry. I highly recommend it. I know that one of her recommendations is to not overdo it by attending every single session, to remember to enjoy yourself and the city. I agree with her however, I decided to use the conference as an opportunity for a vacation/business trip. I left a few days before the conference and visited a friend in the LA area. I arrived in San Diego the first day of the conference and added two more days after the conference onto my trip to unwind and enjoy the city. This allowed me to take in as much of the conference as I could without feeling guilty about missing out on the beautiful city. My goals for the conference were to learn as much as I could by attending the sessions, and there were so many good ones, meet people and get to know them, their work, and the industry, enjoy myself by attending extra events like the book launch, division dinners, and after hours café, and to check out the exhibition hall, attend CAT tool workshops, bookstores, and find out about universities providing translation studies. My goal was not to collect as many business cards as I could but to interact with other translators both on a personal and professional level, learn about the profession I’ve chosen while taking basking under the beautiful sun, an impossible feat in Toronto at the end of October. The conference was everything I thought it would be and more. I was able to meet those whose webinars I have attended, some from eCPD, as well as authors of books I’ve read. I’m definitely attending next year’s conference in San Antonio. I’ve never been to Texas and Austin is on my list of places to visit and it’s only 2 hours away!!! I think I’ll plan my trip pretty much in the same manner as SD. Welcome back!! Thank you for blogging about interesting and informative topics. And most importantly, congratulations on your beautiful baby girl. p.s. it may not have been so brief afterall. Thanks for sharing your impressions, Sarah. I could not attend the ATA Conference this year, but I was a first-time attendee last year in Boston, and I thoroughly enjoyed it, for pretty much the same reasons you gave here: professionalism and goal-oriented approach combined with friendly openness. And yes, the coloured tags are a really useful way to identify other attendees we may strike a conversation with based on common language combinations or interests. I was also overwhelmed by the size and quality of the programme, and I was very pleased to meet face to face people and colleagues I’d only interacted with online before. I also found the CAT tools demo sessions I attended very useful, for someone like me who was contemplating whether buying or upgrading my existing tools at the time. Thanks a lot Sarah for your blog post, which is very comprehensive. I am planning to attend in 2014 and I am sure I will come back to this post in due time. I have also read Jill’s presentation and I found it really full of helpful practical tips that will certainly come in handy when I attend my first ATA conference. Thanks a lot to you both and to other colleagues who offered a review of their conference. Awww shucks. Thanks for the shout-out. I’m really glad my webinars prepared you for the conference. Hearing such positive feedback makes it worth doing. I was also really glad I got a chance to meet you in person. Lunch was a total hoot. I’m glad to hear you enjoyed the conference. I tend to view it as a working vacation as well, so you’re not alone.